Kaluapapa Peninsula on Molokai, one of the attractions on Molokai. Interested in some of the best attractions on Molokai? If so, the island of Molokai is full of hidden treasures, quaint shops, restaurants and glimpses of Hawaii’s fascinating past. For families opting for a Hawaiian vacation without the crowds and congestion, this island is the place to be. And there is no better way to explore Molokai than to venture out on the open road. Start your journey from the town of Kaunakakai. Gear up with a treat from Kamoi Snack-N-Go. Here, there are over 30 unique flavors of home made ice cream. You can also head over to the famous Kanemitsu’s Bakery & Coffee Shop. Here, you can grab some of the beloved Molokai hot bread as well as other baked goods. Need something more substantial? If so, there are popular breakfast and lunch items such as fried rice and fresh fruit plates. West of Kaunakakai, stop at the Kiowea Beach Park to check out the still thriving fish ponds. The best time to come here is around sunrise. This is when colors over the horizon fill the morning sky. If fishponds are particularly interesting to you, then you won’t want to miss the Ali’i Fishponds. You can find them just east of Kaunakakai. Here, the ancient Hawaiians established over 60 fishponds over 800 years ago. Near Kiowea Beach Park is an impressive forest of over 1,000 coconut palms. They were originally planted by King Kamehameha V in the mid 1860’s. Now, they extend over 10 beautiful acres of coast land. Be sure to heed the signs warning of falling coconuts, which can sometimes cause serious injury. Just across the street from the grove is Church Row. This place features a long line of seven churches, each representing a different denomination. Here, the variety of churches bear witness to the missionaries who once came to this remote paradise. The idyllic south shore of Molokai is as long as it is picturesque. Protected by dense reefs, the beaches here are perfect for swimmers and snorkelers of any age. Pack your picnic and plan to stop at Kumimi Beach. 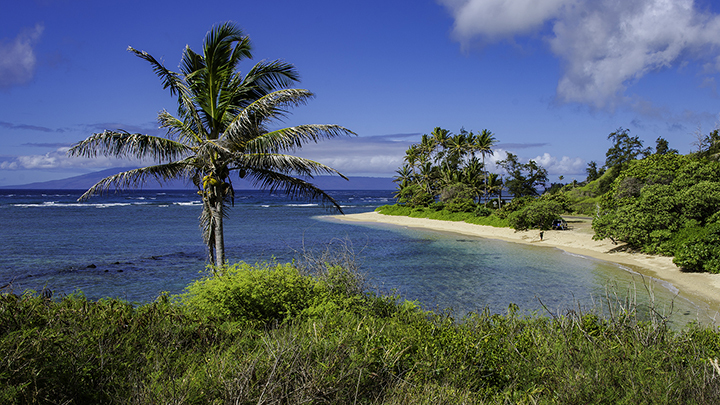 Also known as Murphy’s Beach, it is one of the more popular beaches on Molokai. 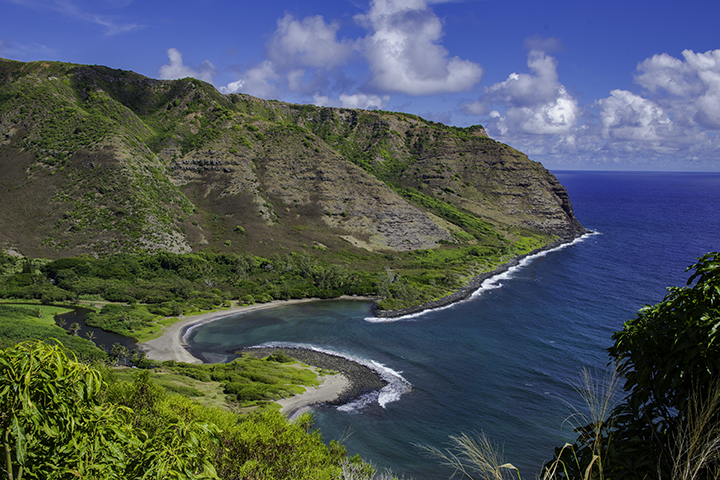 One of the features that Molokai is most famous for is its highest sea cliffs in the world. At Pala’au State Park, you can see these breathtaking cliffs. 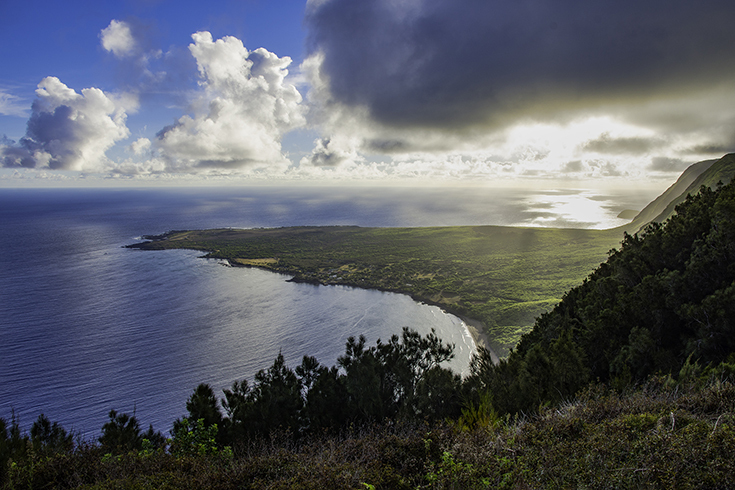 Below the cliffs, you can see the Kalaupapa peninsula and Kalaupapa National Historical Park. It’s probably one of the most popular attractions on Molokai. Also, a verdant forest of pine and spruce trees surrounds the park area. This place is definitely one of the most popular attractions on Molokai. Any Molokai trip should include a visit to Halawa Valley. You can find the valley on the northeastern side of the island. This is one of the most picturesque attractions on Molokai. Here in the valley, you’ll see towering waterfalls and beautiful rain forests. Starting from Kaunakakai, the drive is roughly 26 miles along a narrow and winding road. But the hour-long journey will lead you to some loveliest vistas in all of Molokai. While on the road to Kualapu’u, stop by the Coffees of Hawaii plantation to sample its delicious espresso. If you have some time, you can even take a tour of the coffee farm on a mule. Nearby in Ho’olehua, there is the beloved Purdy’s Natural Macadamia Nuts farm. Here, kids and adults can try their hand at cracking some of its fresh and flavorful nuts. Stop for some of the most scrumptious food on the island at the Kualapu’u Cookhouse. Here, the portions are huge, great for sharing or devouring all by yourself. Try the classic plate lunches, fresh ahi tuna or local egg omelets. You will be pleased that you made time to dine here. Toward the town of Maunaloa, you will find the Big Wing Kite Factory. The owner offers free kite-flying lessons with his beautifully hand-crafted kites. The store also offers Hawaii-made and internationally imported goods, jewelry and crafts. They make great souvenirs to bring home from your trip.